While I've been reading Kitchen Tips Tuesdays for some time now, this is the first time I am participating in Tammy's blog carnival. For more great kitchen related tips and solutions, be sure to check out Tammy's Recipes. I have some serious issues with smells and fragrances. I'm very particular about perfumes and scented candles and even smells of food. This is the case on any normal day. When I was pregnant, my issues with smells were magnified 100 times! Okay, maybe I'm exaggerating a bit, but one little smell of something cooking and I was off and running to the bathroom to...well, you know....hurl. Ugh! It was awful! Cooking smells seemed to be the worst offender during my pregnancy. As a result, we were eating a lot of take out and fast food. That got old pretty quick. So did cold cereal. After a few weeks of not being able to cook anything myself, my husband started to use the grill to make some quick meals. Grilled chicken or steak. He was using the grill just outside the garage door, so that he could keep warm in the garage while the food was cooking. That gave me the idea to use my crock pot in the garage. We have an attached garage, so it's not too difficult to fill the crock pot in the kitchen and set it up on a table in the garage, keeping the cooking smells out of the house itself! Plus, using the crock pot in the garage frees up the little bit of counter space I have in the kitchen. On my other blog, I've posted a recipe for Crock Pot Ravioli. This was a favorite of mine while I was pregnant, because it was so simple and a definite fix and forget type meal. I'm also sharing this tip on Crock Pot Wednesday, since it's crock pot related. And I am also sharing with Works for me Wednesday. It worked for me! We purchased our home 2 years ago. It's an older home, I think it was built in 1955. I also think that the only upgrades that were made to the house by the original owner was the whole house vacuum system that was installed it he 80s and the avocado green and gold carpets from the 70s. While I'm loving the whole house vac, the carpets were ripped up and thrown away on our first day in the house! We still need to do a lot of work on the house, but time (and money) is always an issue. Last year, our wall oven broke. As with everything else in the place, it's the original oven that was installed when the house was built. It's small, it's ugly, it's old, but it's all we've got at the moment. For us to replace the oven with something more updated, we would have to do an entire kitchen remodel. That is something that is so not in the budget right now, or in the near future. When the oven died, I tried to get by without it as long as I could. I didn't really think I used it as often as I actually do. Finally, my husband found an appliance repair shop a couple of towns over. He told the owner that he believed that the heating element went in the oven. He gave the owner our model number and serial number and was able to order a new heating element for the oven. A few weeks later, the shop owner called my husband to let him know that the part was in, my husband picked it up on his way home from work and installed it himself when he got home! So, for $40, I have my small, ugly, old oven back! Hoping it will hold up and allow us to make do until we can afford the kitchen remodel! For more Make Do Monday tips, visit My Practically Perfect Life. I am also sharing this post at Life As Mom's Frugal Friday. Last week's plan turned into a jumbled mess. Most of what I planned for the week was prepared, but not on the appropriate days. We skipped French toast and sausage since we used up the bread to make sandwiches throughout the week. But we had plenty of leftovers to make up for it. Which is better, since nothing was wasted. Also, we skipped the turkey dinner on Sunday. It was a long week and niether of us was really into preparing or cleaning up after a big meal. So, that will carry over to this week. *Check back next week, I'm hoping to add recipe links for the chili and pepper steak. I don't usually measure when I prepare either of these dishes. I'll try to make it a point to measure so that I can share these recipes here and on my other blog. For more menu planning inspiration, visit Menu Plan Monday hosted by I'm an Organizing Junkie. Steven Singer Jewelers has teamed up with 1210AM's morning radio host Michael Smerconish to create the 9/11 tribute pin. For a $10 donation, you will receive a 9/11 Never Forget Pin designed by Steven Singer. 100% of the proceeds will be go to the Flight 93 National Memorial Fund. Oh, the shipping is FREE! Singer and Smerconish are hoping to raise more than a million dollars to donate to the memorial fund, so far a check for $10,000 has been given to the fund. Click here if you'd like to read more about the Flight 93 National Memorial Fund. Click here if you'd like to order the commemorative pin. Available only until September 30, 2009. My husband came home from work late on September 10th and placed an order online for 3 of these pins. It was about 8 or 9 in the evening. He placed the order, thinking that we would get them pins in about a week, maybe more. We were extremely surprised to see the package from the jewelers in our mail box on the morning of September 12th! We are truly pleased with Steven Singer Jewelers not only for the attention and speedy service given to our modest little purchase, but also for his generosity in creating and selling this commemorative pin to raise money for such a wonderful cause. I like to keep liquid soap by the kitchen and bathroom sinks for washing hands. Bar soap, while cheaper than liquid soap, just gets messy. I don't like messy. I like easy. But I also like cheap (I mean FRUGAL). Liquid hand soaps can get pricey at the supermarket or Walmart, so I've always bought it at the dollar store. Just whatever, basic, not too flowery scented, liquid hand soap they offered. Well, after the birth of our daughter 4 months ago, my husband went a bit crazy with buying liquid hand soap to keep by the sinks. He had a couple different types at each sink for guests to choose from when coming to see the baby. My favorite of the soaps he bought, was the Dial Foaming hand soap. It was a treat, since the dollar store doesn't carry that kind. But I couldn't wait to refill it with some cheap (FRUGAL) soap mixed with water, like I've read on some of the Frugal Friday tips. Naturally, when the dispensers ran out, I didn't have any of my cheap hand soap to refill them. In the bathroom, my dollar store body wash bottle, was almost finished. I was going to add water to it and shake it up to finish using it up for my showers. But then I figured I would fill the foaming dispenser with it. Perfect! I'm getting more hand washings out of that little bit than I would have gotten if I used it as a body wash! In the kitchen, I refilled the foaming dispenser with my dish soap. I've been using Ajax Ruby Red Grapefruit scented dish soap. I have issues with fragrance making me sick to my stomach, but I love the smell of the Ruby Red. After about a week, I realized it was silly to keep the bottle of dish soap AND the foaming dispenser filled with the same dish soap on the counter. Especially since, most of my dishes are put in the dishwasher. Only a few get washed by hand. I tucked the big bottle of soap under the sink and use the foaming dish soap to wash the dishes. I pump a bit of the soap onto my sponge and wash the dishes! It's just enough to wash the small amount of dishes that didn't make it into the dishwasher! So, I'm saving money by eliminating the need to purchase a separate hand soap, stretching the body wash by not wasting the last bit in the bottle, stretched the dish soap by using less to wash dishes and also managed to save myself some counter space in the kitchen (I think that's my favorite part)! To read about more money saving tips, go to Frugal Friday hosted by Life As Mom. I really enjoy sitting under a blanket on my sofa with a big mug of cocoa on a brisk fall day, looking out my window and watching the pretty orange and red leaves falling from our trees in the yard, with a fire burning in the fireplace. The house all warm and cozy. The only thing to make a day like that better is to have the aroma of a spice cake baking in the oven floating through the house. Now, I'm not much of a baker. In my entire life, I've only ever made two cakes from scratch. One was excellent and the other....well, not so much. So, I usually stick to baking cakes from a boxed mix. While I was on Weight Watchers about 6 years ago, I often read the message boards. The craze at the time (not sure about now) was baking cakes using canned pumpkin (not pumpkin pie filling) instead of the eggs, water and oil that are supposed to be added to a boxed cake mix. That was it. Just cake mix of your choice and a can of pumpkin. Mixed together and baked according to the directions on the box. Mix first five ingredients together as you would if you were making a traditional boxed cake. Bake according to the directions on the box, baking time varies depending on size of pan you are using. Frost with cream cheese frosting. Or, like a lot of the Weight Watchers would do, just top each slice of cake with a dallup of fat free whipped topping. Fall colored sprinkles or candy corn make nice decorations for this cake. Raisins would be good added into the mix along with the chopped walnuts. I make this cake several times during the fall season and I even make it to take to Thanksgiving dinner at my parents' house. Note to self: You are not Wonder Woman! Being a new mom has been a wonderful, new and sometimes overwhelming experience. Since my daughter has been born, my brain just doesn't retain all of the information it did before her birth. I've started this blog as a way of keeping my thoughts, recipes, tips, etc. all in one place. Not only to share with family and friends, but to keep this scatterbrained momma a bit more organized. I also started meal / menu planning. Each week, I plan what I will prepare for dinner each day. I try to keep in mind what ingredients I have on hand in my pantry or freezer while I plan each week's menu. It has helped me keep up with making sure there is dinner on the table every night. And I no longer stand staring into the refrigerator every afternoon wondering what to make, since I forgot AGAIN to thaw something for dinner. I went from not cooking for over a year due to morning sickness, to just being too tired and swollen during my pregnancy to cook, to being to exhausted to even think about feeding the adults in the house once the baby was born, to cooking full meals every night and trying to be creative and make a new dish every day plus trying to have some meals prepared for the freezer! Last week, it all caught up with me. My husband has been working a lot of over-time lately. And while I am so thankful that he has a job and for the extra money in his paycheck each week, the being home alone with the baby for so many hours (over twelve hours every day including commuting time) is starting to get a bit old. Plus, I bathe the baby after clearing the table from dinner. The later my husband was getting home, the later I was bathing her and the fussier she was getting because we were messing with her schedule. And it was making me feel very stressed. So much so, that I decided not to follow my menu plan for last week and declared Friday a leftover night. And not just a leftover night, but a fend for yourself night!!! Usually, if I decide to serve leftovers for dinner, it's something that has a few servings left to it. Like a big batch of chili or stew or something. But lately, when I have a lot of a meal left, I've been stashing it away in the freezer. Trying to stock up for the winter. So, the leftovers in the fridge tht night were just small portions of this or that. We each reheated our own meal and either ate right out of the serving dish or used a paper plate. We each cleared our own dishes from the table, loaded what needed to go into the dishwasher and that was it! We didn't each have the same things on our plates for dinner and you know what.....it was okay! The world didn't end! We still ate together and chatted over dinner the same as if it was a huge meal that I cooked all day. Except for the fact that I felt less pressure while I ate, thinking about all that still needed to be done immediately after dinner. Since I knew that clean-up from dinner would be so simple! So, while keeping organized by blogging and menu planning and even having a fend for yourself leftovers night all work for me, the one thing that works the most is: reminding myself that I am not Wonder Woman and that it's okay! 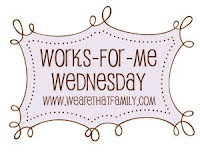 For more useful, household tips head over to Works For Me Wednesday hosted by We are THAT Family. I thawed a 6 lb. pork loin and it was ready sooner than I thought it would be. I forgot that we had plans to be out of the house one night. And I needed a leftover night, not only to use up some stuff that had to get eaten, but also for my own peace of mind. All the extra cooking from the pork loin with a fussy baby, really was getting to me. I had to rearrange or even omit some of my planned meals. So, if you see them listed here again....no, I'm not serving it again this week, it simply was left off last week! Also, last week's menu was a bit too much for this new momma! I need to keep it easy this week, especially since none of this week's meals really allow for a leftover night. For more meal planning inspiration, visit Menu Plan Monday. I know that most of you frugal mommas breast feed. It's more frugal and most importantly, it's healthier for your baby. But, sadly, from experience, I know that breast feeding is not always an option. I won't get into details, but I'll just say that I had a very difficult time breast feeding. The result, after numerous attempts (and tears) was a frustrated momma and an even more frustrated baby. So, for any of the mommas out there that chose to use formula to feed their babies, here's a link for a $5 coupon for any size Emfamil Premium with Triple Health Guard Powder Formula. Act fast, the coupon expires 10/18/2009. Check out Frugal Friday for more great money saving tips! The word "leftovers" used to be a dirty word in my home. With a few exceptions, I used to HATE leftovers! Seriously! I tend to cook too much food for just the two of us and as a result we are stuck with leftovers. I would pack them away in a Rubbermaid or Tupperware bowl and hope (pray) that my husband would take them for his lunch. Through the years, I've started to enjoy leftovers. They allow for a No Cooking Night! Easy clean up too, since we usually would just pop the container into the microwave and serve on paper plates (before we had a dishwasher). A few posts ago, I talked about White Chicken Chili. In that post, I promised to tell you what I created with the leftovers. Before I do, I want to dedicate this Frugal Friday post to my best-est friend, Lisa at Extraordinary Life. Not only did she inspire me to create this meal, but it's also her birthday today! So, stop on over to her blog and wish her a happy birthday! It would surely make her day! My hubby and I are big eaters. I thought that 2 each would be a good amount to serve for dinner. Surprisingly, we each only ate one. They were that filling! From that single crock pot of White Chicken Chili, I was able to get dinner for 4 nights! First night was the chili served over rice, a few nights later we had the enchiladas and I was able to store enough of the chili away in the freezer to use for enchilada filling for 2 more nights! All from 3 chicken breasts! (Oh, forgot to say that the 2 enchiladas left out of the 4 I made, my husband ate for lunch one day!) That's a lot of meals! I'm not one to calculate what each recipe costs to make, but I am pretty sure this was on the frugal side. Especially, since to serve the enchiladas, you only need a small amount of the chili mixture. Leftovers are no longer a dirty word in my house! I love that we are able to save on our grocery bill by making another meal (or two or three) from using up leftovers! Slowly but surely, I am starting to "get" this frugal lifestyle! For more Frugal Friday tips, head on over to Life As Mom! To check out more of my recipes, check out my other blog, My Vintage Kitchen. October 1st is BEAN DAY over at the October Fest Carnvial of Super Foods being hosted by Katie at Kitchen Stewardship, be sure to check it out for more great recipes! When we lived in the city, in our apartment with the tiny kitchen, we both worked. We both hated our kitchen and hated to cook in the hated kitchen. We went out to eat a lot. If we didn't go out to eat, we ordered take-out. Sure, sometimes I cooked, but after a long day at work, the other 2 options always seemed better. Now that we live in our little house in the country, we only have one paycheck and a mortgage that is more than our rent was in the apartment. The kitchen in our home is not really any bigger than the hated apartment kitchen, the appliances are actually worse (older) than the ones in the apartment. BUT, this tiny kitchen with the really old appliances is OURS! So, we try to love it! Love it or not, higher bills & less pay doesn't really allow for all of that going out to eat or ordering take out. So, we do what we can to try not to miss it so much. We try to copy meals that we would order when dining out or ordering in. One of our favorites is Mexican food. Yum! And after that long intro about our hated apartment kitchen, it's a little funny that my husband came up with this meal on one of the rare nights that we actually cooked in that kitchen! It was a long week and we just wanted to stay in, and didn't want take-out. We only had one chicken breast and were trying to come up with something that would stretch it, so that we could avoid going out. Heat refried beans in microwave safe bowl until warm. Saute chicken, bell pepper and onion in a small amount of the dressing or fajita sauce, as you would if you were using cooking oil. Don't let the veggies get too soft. Just before the chicken and veggies are finished cooking, add the black beans and heat until warm. In a baking dish with sides, put down a layer of the chips, then layer with the refried beans, chicken/veggie/black bean mixture, more chips, more of the refried beans, more of the chicken mixture....you can just do one layer if you wish, or as may layers...sprinkle cheese and pop into the oven until the cheese is melted. Top with sour cream and dig in...preferably on the sofa while watching a movie or football game! YUM! I didn't give measurements, since we just make this with whatever is on hand. Sometimes we have veggies that need to get used up before they turn to soup (not the good kind) in our veggie bin. We have made this with chicken, steak, or ground beef. Our favorite is with chicken. Sometimes the Brianna's dressing is difficult to find, especially the Santa Fe flavor. When I can't find it, I'll substitute with either a bottle of fajita sauce or a seasoning packet from the Mexican food section of the grocery store. For more great recipes like this, head on over to the Ultimate Recipe Swap hosted by Life As Mom. Also, be sure to check out the October Fest Carnival of Super Foods hosted by Katie at Kitchen Stewardship. October 1st is bean day! I LOVE free stuff! Free Stuff works for me! Kashi is giving away some free samples of their cereal. I think the promotion is good until Sept. 25th, while supplies last. Lisa, at Extraordinary Life received her sample in the mail today! She says that a coupon for $2 off one box of Kashi comes with the sample! How great is that?! I read about the Kashi Free Sample offer in an email from Hungry Girl. Sign up to receive "Tips & Tricks...For Hungry Chicks". You can also add Hungry Girl to your FaceBook friends list and get daily updates! 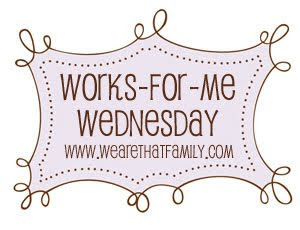 For more tips like this, head over to Works For Me Wednesday at We Are THAT Family! I've been trying to Meal Plan for a while now. 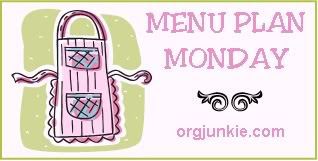 This is my first post to Menu Plan Monday hosted by Laura at I'm An Organizing Junkie. I'm a list maker. I love to make lists. But I rarely stick to them. I thought that posting them to a blog would make me more likely to stick to a plan. And so far (the past week or two), it seems to be working. Last week was pretty hectic. We tried to stick to the menu as much as possible, but we strayed a bit. But I am happy to say that we had very little waste this week. 99% if the leftovers were used up and only a few things from the veggie bin (several weeks old) needed to be tossed. I never got around to thawing the pork loin last week, so I will do that this week and make the pork & sauerkraut that I intended to make last week. For more great menu plan ideas, visit Menu Plan Monday at org.junkie.com! When I worked, I didn't always use coupons. Sure, if I had a coupon for something, I'd use it. But I didn't go out of my way to search for a coupon. I've recently discovered the wonderful world of online coupons! Free coupons that can be printed out on your computer! Who would have thought? I know, this isn't a new thing to most of you frugal ladies. But this is relatively new to me! Now that I am a full time homemaker and no longer bringing in a paycheck, every little bit of money saved on groceries, entertainment, drug-store items, etc. is a great help. I posted about this coupon for Lea & Perrins Thick Classic Worcestershire Sauce a few days ago, but wanted to share it with all of you for my first post to Frugal Friday. 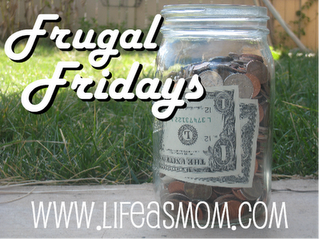 For more great ideas about saving money and getting out of debt, visit Frugal Friday hosted by Life As Mom! I don't have much need to pack lunches these days, but I wanted to share with you, one of my favorite lunches that I used to pack when I worked. Whenever I would make hot dogs, baked beans and baked potatoes for dinner, I would always bake an extra potato. (I usually baked my potatoes in the microwave.) I would cut it open, mash it up a bit, put it in a microwave-safe bowl and add whatever seasonings I liked. After dinner, if there were beans leftover from dinner I would put a scoop or two full over the potato. If there was a hot dog left, I would slice it and add to the potato and beans. If there weren't any leftover beans or hot dogs, I would just pack the potato with butter, salt and pepper. Or, I'd pour about 1/2 a can of creamed corn over the potato. YUM! Those were a favorite lunch of mine when I worked and sometimes I will still have that for lunch at home. Since I've been a homemaker for the last two years, the ways we spent/saved money has needed to change. The loss of my paycheck has been a challenge but we've been working at keeping unneccessary spending to a minimum. We really try to only spend on the basics. I've been trying to earn a little money here and there by selling on ebay, craigslist, and yard sales. I've also taken orders for hand made wedding invitations, graduation invitations and greeting cards. Another way that I've tried to earn some cash is by participating in online surveys. They don't pay a lot, but every little bit helps. I just recently received a check in the mail for $4. Four dollars for sitting at my computer and answering a few questions! Ten - fifteen minutes...that's it! Survey Savvy is the survey company that sent me the $4 check. They not only pay for the surveys you qualify for, but also for the surveys that your friends take (after you refer them)! If you want to join and start earning money (without leaving your computer chair!) then click this link and sign up now! You won't be sorry!!! Tonight, after dinner, I had a little bit of a break from the baby. My husband played with her for a while, so I could get some stuff done in the kitchen. I only had about an hour, maybe a little more, and I think I used my time well to get a lot accomplished. Lisa, at Extraordinary Life, talks about preparing and freezing Ground Beef Base. Since we purchased 5 lbs. of ground beef the other day, I decided to give this a try. In the past, I would separate the raw meat into 1 lb. portions and freeze each pound separately in freezer bags. It never really occurred to me to cook it first. I already used 1.5 lbs of the meat for burgers on Monday. Meatloaf is on the menu for Thursday, so I mixed up and shaped a meatloaf using another 1.5 lbs. That left me 2 lbs. of ground beef to work with. A perfect amount to try this out for the first time. I browned the meat and added some diced onion and diced red bell pepper. I wanted to add celery and carrots too, but after checking the veggie bin, I realized they had spoiled. I really need to work on planning my meals better to avoid waste. After draining the meat base and letting it cool, I evenly distributed it into 2 freezer bags and they are now in my freezer. Now, when I plan my weekly menu, I can plan to use the mixture in tacos or hamburger helper or any other meal that calls for browned ground beef. This will make meal time a lot easier, especially on a busy day of doctor appointments, or just a day home with a fussy baby near dinner time. It didn't take long to get that done and I also managed to clean up the kitchen too! Oh, the meatloaf for tomorrow is still un-cooked. It's in the fridge in a foil pan (covered) waiting to be popped into the oven at meal time! How easy is that?? I'm excited to post my first Works For Me Wednesday post! I've been reading WFMW for a while, but new to blogging myself. I'm happy to share my tip on saving money on gas! To read more helpful tips go to We are THAT Family. My husband and I usually shop at GIANT Food Stores. Shopping there works for us because it's the closest grocery store to our home and also because they offer discounts on gas when points are accumulated. Points are earned according to the dollar amount spent and will add up during each sale during the promotion. Another way to earn points is to buy certain items each week (all on the same receipt). The sales flyer usually has 3 different lists of items. If you buy 5 items from one list, 20 cents off per gallon of gas is earned. Or 6 items from another list. Last week, we earned an extra 60 cents off per gallon of gas. We hadn't used the points earned from our previous trip, so on our last fill up we saved $1.20 per gallon of gas!!! On Saturday, we took a day-trip to visit friends. They live 2 hours away. Hubby went to fill up the truck before we left. 17.773 gallons would have cost us $48.33 without our gas points. After our $1.20 savings (per gallon) was deducted, our total for gas was $27.00. We saved $21.33 to fill the truck! We could have saved more, if we let the tank get lower before our fill up, but we needed to make sure we had enough to make our trip. I was thrilled with the savings and really happy that hubby saved the receipt so I could blog about it! I love, love, love coupons! To share the coupon love, here's a link to a $1.00 coupon for Lea & Perrins Thick Classic Worcestershire Sauce. Just fill out the form and then you can print out the coupon! I didn't do as well with the deals at Giant Food Stores this week, so I will only point out the highlights of the shopping trip today. In addition to those coupons, I had a print out coupon from the register from my last purchase for $2.50 off my next purchase that I used this time! The recipe I use for hamburgers is not my own, but it's one that we really enjoy. We used to just buy our burgers in the freezer section of the grocery store and really got bored with them. Bubba Burgers were the best frozen burgers but were pretty pricey and only bought on rare occasions as a treat. Usually, we just bought the cheapest frozen patties available. Over the winter, I was craving (during my pregnancy with my daughter) hamburgers. I didn't want store-bought, I wanted a nice homemade, hand-pressed burger. I also wanted simple and easy. I went to the Lea and Perrins website and did a recipe search and found this recipe for Mini Meatloaf Burgers. They were a hit! Pregnancy craving was satisfied and even my hubby liked them. I've been making them this way ever since. I even use the same recipe when I make meatloaf or meatballs. YUM! Today, when I made burgers, I made a couple of changes to the recipe. * The original recipe calls for 1 lb. of ground beef, making 4 patties. I increased the meat, keeping measurements of other ingredients the same. I was able to get 7 burgers from the mixture. The original recipe also calls for 2 tbsp. of plain breadcrumbs. I usually use Italian Breadcrumbs because that's usually what I have in my pantry. This time I was all out and didn't have time to make my own, so I used quick cooking oats. I measured out the 2 tbsp. and poured them onto my cutting board and gave them a quick chop. Worked perfectly! My husband cooked them on the grill tonight, but I've also made them on the stove using a grill pan. Great either way! Less clean up for me when hubby grills them! This week is a bit hectic for us. We'll be out of the house 2 nights this week and hubby will be gone an additional night. So, even though I'm planning on certain meals, they may not happen. * = the nights we'll be away from home, I have a meal planned in case we end up at home during meal time, but if not, we'll adjust the rotation a bit. When I was a kid, my mom did most of the cooking. Although, I do remember my dad cooking breakfast on the weekends. When my dad did cook dinners, it usually involved a jar of gravy and leftovers. Leftover hamburgers would be served the next day, reheated in gravy, served with buttered egg noodles and either a canned or frozen vegetable. Same with leftover turkey or chicken. At the time, I thought it was boring. Now, I realize it was frugal. On Friday, I prepared a whole chicken in the crockpot. We had about 1/2 of the chicken leftover. So, tonight, I made a meal that reminded me of one of dad's dinners. Using items that I almost always have in my pantry. I boiled some egg noodles, diced up the leftover chicken and added to 2 cans of chicken gravy. I also added about a tablespoon of the saved chicken drippings to add a little extra flavor to the gravy. (It could have used a little more.) So, we had the chicken and gravy over the buttered egg noodles and served with biscuits and a can of peas. Each of us (my husband and I) had nice, big portions. My husband had seconds. We even treated the dog with a little over her kibble. (Yes. She's spoiled.) And we have another single serving left to put in the fridge for either lunch for one of us or for dinner if one of us isn't hungry. I think the only difference between my meal and the way my dad used to make it was that I used the thicker, heartier egg noodles. I have a few more ideas for using leftover chicken and I'll be posting them as I try them. Cooking a whole chicken in the crock pot is a new favorite meal of mine. Mostly because it's so easy. I also like the fact that we can get a couple of meals out of it. Making it an extremely frugal recipe. Easy and Frugal ~ what a perfect combination! Last month, I bought 2 whole chickens at Costco for $8.00. I prepared one in the crock pot last month and just made the second one today. For us, we can usually get 2 meals from one chicken, making the chicken for each meal cost only $2.00! This is the recipe I based today's meal on. I altered it a bit according to the ingredients I had on hand. Also, I doubled it. I found that when I prepared my chicken last month (using a different, but similar, recipe) the spices just slipped right off of the chicken. It was still tasty, but we suspected it could be better! Doubling the amount of spices and drying the chicken after rinsing seemed to do the trick this time! 6. Cooked on low for 6 hours. The original recipe suggested applying the dry rub and refrigerating overnight. I skipped that part. I also skipped the onion that the recipe called for, since we were out of onions. I really like the way this turned out. It was much better this time. I cannot recall what recipe I used for the first chicken, although it was very similar. I definitely recommend patting the chicken dry with paper towels before adding the dry rub. It will stick better to the "dry" chicken. Any water left on the chicken will cause the spices to slide right off. I served the chicken with leftover sliced potatoes (recipe for another post) and steamed veggies. Making this a very frugal meal. We have about a 1/2 a chicken leftover for another meal. I just need to decide what I will create with the leftover meat. Also, I saved the juices left in the bottom of the crock pot. It's probably too spicy to use alone as a broth or stock, but would probably work if added to a recipe for a little extra kick! I have it in the fridge now, so that I can separate the fat from the liquid. Once I do that, I will freeze in ice cube trays and then into a ziplock bag. Just enough to add a little zing to another recipe. I discarded the carcass this time. I've heard that chicken stock can be made after the chicken has cooked in the crock pot. I plan to try this another time. Maybe with the next one...and there will be a next one! One of my goals for the upcoming weeks is to fully stock my pantry and basement freezer for the winter. It's not as if we live in such a rural area that we're afraid of being snowed in or anything. Just now that we have the baby, we'd like to avoid taking her out if it's too cold. If we keep the freezer and pantry stocked, then my husband can just stop for the essentials (milk, bread, eggs, or any last minute recipe ingredient) on his way home from work. During the winter, a lot of our meals are soups or stews with bread or biscuits. Not only are they excellent comfort foods, they also freeze well! That's very important to us. Since it's just the two of us eating (for now), there would be too much left over to keep in the fridge. We would have to eat it every night for a few nights to finish it. That's boring! So, I freeze whatever soup or stew is leftover. I try to determine if I can get another night or two (or THREE, if I'm lucky!). Let food cool before storing. Fill ziplock with soup or stew or pasta sauce. Carefully, squeeze out the air while zipping up. Lay flat in freezer until frozen solid. I like this method of freezing, because the bag can be frozen all flattened out. Allowing more freezer space. When you have several bags frozen this way, they stand up or stack nicely, using freezer space more efficiently. I keep a space empty in my kitchen freezer, so that I can easily freeze my ziplock bags. Once they are frozen solid, I carry them down to my chest freezer in the basement. Sometimes, if I am too busy, I'll grab for a plastic, quart-sized container (won-ton soup container is perfect) and store my soup in that. But these seem to take up too much room in my freezer and waste too much valuable space. Lately, the slow cooker / crock pot has become one of my most used kitchen appliances. Actually, it comes in close second, only to be beat by my dishwasher. I find my day to be very hectic and unpredictable now that we have a baby. And after several weeks (months) of eating take out or cereal for dinner, I discovered that if I am able to find 10, maybe 15 minutes in the morning to throw something in the crock pot, then we can have a nice, healthy meal. About a week ago, I made White Chicken Chili in the crock pot / slow cooker. I've made it before, but never in the crockpot. After a conversation with my cousin, I decided to try it. Place chicken in crock pot. Add beans, seasoning packet and water. Cover and cook on low setting for 2 hours. Add peppers, onions, and corn. Test chicken, it should be able to be shredded at this point, if not let cook a bit longer. Shred chicken in a separate bowl, and add back to the crockpot. Stir and continue cooking for 2-4 more hours. *Note: I really liked the way this turned out. But after adding all of the extra stuff not specified on the package, it kind of tasted a bit mild. We like a little more spice to our chilis. Next time, I will use 2 packets. The mild flavor worked well when we used the leftover chili as filling for enchiladas! Katie at Kitchen Stewardship is hosting October Fest Carnival of Super Foods. October 1st is BEAN DAY! You can see this recipe there! I've been wanting to post this for a few days now. Mainly to remind myself of the good deals I was able to get. But also, to hopefully inspire family and friends to clip coupons and shop sales. we earned 20 cents off per gallon of gas. we earned a coupon for $2.50 off our next purchase. Less double coupon for one. I need to say, I am so impressed with my $23.80 in coupons, the fact that we shopped sales for almost every item, that we earned 60 cents off per gallon of gas (bringing our total to $1.20 off per gallon) and that I earned a coupon for $2.50 off our next purchase! 59 items for $73.89 ~ not too shabby! Especially considering that almost $11 was formula. Well, it's a little late in the day to be posting this, but wanted to get it posted anyway. Life with an infant doesn't allow for much to go as planned. So, here I sit, in my PJs posting to my blog while everyone else (hubby, baby, dog) is finally sleeping! Monday: spaghetti with meat sauce, kaiser roll with butter. Wednesday: hamburger gravy over campanelle pasta, biscuits. A lot of pasta this week. I am raiding the pantry and freezer this week and next week. Trying to cut back on groceries the next couple of weeks. So, it's a bit challenging to come up with meals, but I like a challenge. I made a big batch of meat sauce and had enough to freeze for another meal. I let it cool, then poured into a gallon sized ziplock freezer bag. It's laying flat in the freezer in my kitchen now. Once it's solid, I'll put it in my chest freezer in the basement. I've been trying to cook ahead as much as I can. As I stated in the beginning of this post, life is unpredictable with an infant in the house. So, if I manage to make a big batch of something and freeze half for another night, that extra something can save us cash on a bad day that I don't get to cook dinner. Saving us cash by avoiding take out! So, while hubby entertained the baby for about an hour, I was able to prepare dinner for three nights! More if you want to count leftovers and the lunch portions of spaghetti and hamburger gravy (one each)! That's a lot of meals for just one hour of work! Someday, I'd like to try Once A Month Cooking. In addition to finding a day to devote to cooking, I also have to get hubby on board with this idea. It seems pretty expensive to start out, but I am guessing that is just for the first month. (?) Maybe it gets cheaper as the months go on and less needs to be purchased. (?) I'm not sure. But it would make meal time easier for me. But for now, the cooking a little extra each time is helping ease meal time pressure.